Drowning in debt? Consider speaking to a Hurst bankruptcy attorney with Allmand Law Firm, PLLC to discuss your options. Our experienced bankruptcy attorneys provide productive debt relief services to our clients in the Mid Cities, including Dallas, Forth Worth, Bedford, and Euless. Whatever financial issues you may be dealing with, our knowledgeable Hurst bankruptcy attorney can evaluate your circumstances and then inform you of your options. We will work to help you towards a better, more secure financial future. By putting our clients first and helping numerous clients find the debt relief they need to have a more secure financial future, we have become the largest bankruptcy filing firm in Texas. We have been featured on Fox News, ABC and CBS News. 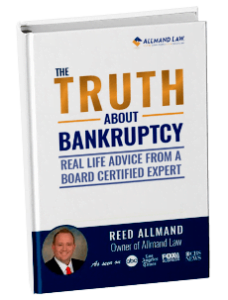 The Texas Board of Legal Specializations have also certified Hurst bankruptcy attorney Reed Allmand in Consumer Bankruptcy. Our bankruptcy attorneys are committed to finding the best debt relief solutions that are tailored to each individual’s needs. We also offer free financial empowerment sessions to give you more financial confidence. Do you believe you are a good tax forgiveness candidate? Are you facing foreclosure or repossession of property? Perhaps you are considering filing for bankruptcy but don’t know if Chapter 7 or Chapter 13 is best for you? Speak to our knowledgeable bankruptcy attorneys to learn about the various debt relief solutions and what is best for you and your family. If you are struggling with overwhelming debt, speak to a Hurst bankruptcy attorney about filing for bankruptcy under either Chapter 7 or Chapter 13. Bankruptcy may not be the best solution for everyone, but it is highly beneficial for those in challenging financial circumstances. A qualified Hurst bankruptcy attorney can help you decide what is your best strategy and plan of attack to ultimately find debt relief. If your debt is consuming your life, then it may be time to speak to a qualified Hurst bankruptcy attorney. We service clients in the Mid Cities of Texas, including Hurst, and the Dallas/Fort Worth Metroplex area. Not only do we offer a free case evaluation with our seasoned Hurst bankruptcy attorney, but we also encourage you to schedule a free financial empowerment session at Allmand Law Firm, PLLC. Our firm’s primary goal is to help our clients get out of debt, and remain that way. Call us today at (214) 265-0123.